Parasites and bacteria have no respect for international borders. Many international frontiers are marked by rivers and lakes; but the water fleas that host Guinea worm larvae, the mosquitoes that transmit lymphatic filariasis and malaria, and the flies that spread river blindness and trachoma don't care which side they're on. If nations are going to protect their people from disease, they're going to need to work together. The Carter Center helps them do that. On the Caribbean island of Hispaniola, a jagged north-south line divides Haiti from the Dominican Republic. Thousands of Haitians — some of them infected with malaria or lymphatic filariasis — cross that line frequently either to do business on the Dominican side or to work as seasonal laborers in the agricultural, construction, and service industries. Mosquitoes, the vector for both diseases, also freely traverse the same line in both directions. So, while the two diseases are much more prevalent on the Haiti side, they are a concern for both countries. Hispaniola is the only island in the Caribbean with active malaria transmission, and Haiti accounts for 97 percent of cases there. It also accounts for about 90 percent of the lymphatic filariasis burden in the Western Hemisphere. In the Dominican Republic, the diseases occur mainly in areas along the border with Haiti and in areas with high concentrations of migrant laborers. 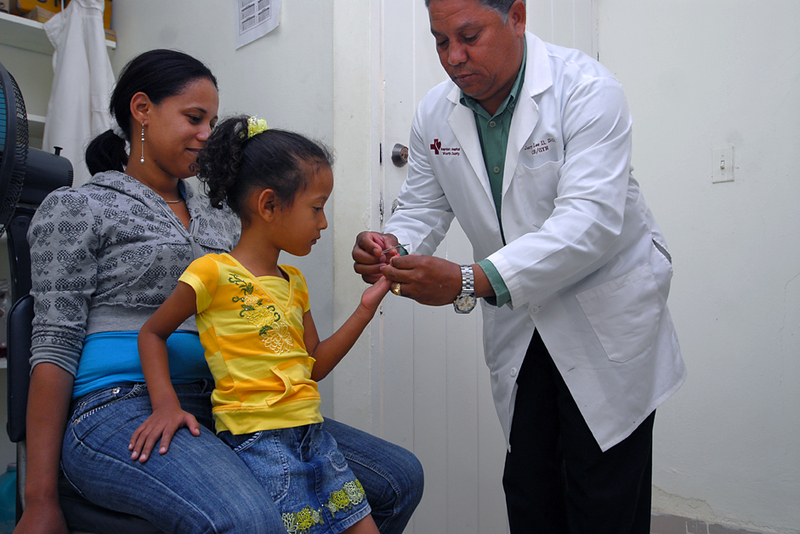 Since 2008, The Carter Center's Hispaniola Initiative has assisted both countries' ministries of health by strengthening binational cooperation, providing technical assistance for elimination of both diseases, and helping to integrate activities between the countries' malaria and lymphatic filariasis programs. "What The Carter Center is doing is getting the two governments to sit down together regularly. The two governments need to talk," said Dr. Madsen Beau de Rochars, a Haitian-born University of Florida epidemiologist who consults with The Carter Center on the Hispaniola Initiative. "The beauty of that is you can have a big dispute at the top level, but at the technical level they're still talking because they know they need to stay side by side to carry out this process. We leave the politics to the politicians." Some countries have to work out disease surveillance and interventions with multiple adjoining states. Mali is a large, landlocked country in northwest Africa. It shares borders with seven other countries, several of which harbor Malian refugees fleeing political unrest at home. This makes cooperation with neighbors essential, said Dr. Marie Madeleine Togo, Mali's minister of health. "Culturally, Mali is a country of exchange – information, trade, everything is exchanged with our neighboring countries," she said. "This covers multiple concerns – agriculture, culture, the arts, commerce. Given this, Mali doesn't have any problem collaborating with its neighbors in different domains, and especially in health." With The Carter Center coordinating, Mali and Niger are working together closely to control the infectious eye disease trachoma in both countries. Representatives of each country's health ministry have attended each other's annual trachoma reviews, observed field activities, and even shared treatment protocols, said Kelly Callahan, director of the Carter Center's Trachoma Control Program. The cross-border partnerships go beyond the level of top officials, Togo said. Mali is divided into 63 health districts, each of which borders another country; all their medical officers are instructed to collaborate closely with their international peers. "They share information, they share data, they share resources, they share strategies, they share their experiences fighting disease," she said. Sudan also has seven adjacent neighbors, including Ethiopia. River blindness and trachoma are endemic to both countries, and coordination of elimination efforts is essential in border areas if either is to see sustained success. For example, transmission of river blindness appears to have been interrupted in Sudan's Galabat focus, but the same cannot yet be said of the adjoining focus on the Ethiopian side of the border, said Biruck Kebede, neglected tropical disease team leader with the Ethiopia Ministry of Health. The area in Ethiopia has received about 12 annual rounds of treatment with ivermectin since 2003. The differing status of the adjacent areas "is a perfect example of how we need to further coordinate our efforts and understanding of the disease burden on each side of the border to eliminate the disease in both nations," Kebede said. Kebede pointed out that all nations in the region have signed a Memorandum of Understanding to support one another in the development of health systems. He noted that several Ethiopian health professionals have traveled to South Sudan for that purpose. Similarly, Venezuela and Brazil have signed a Carter Center-supported MOU to work together on river blindness elimination in their border area in the Amazon rainforest. "There are already ongoing activities, and all the governments know about the need for collaboration," Kebede said. "Because people are moving freely across borders, it's important that we agree on when to conduct mass drug administration or how we carry out vector control," said Dr. Isameldin Mohammed Abdalla, undersecretary of Sudan's Federal Ministry of Health. "Synchronizing this can be challenging, but it can be done if we involve our partners, local and state authorities, as well as the federal ministry." In the end, when it comes to fighting neglected tropical diseases, we're all in this together, the Hispaniola Initiative's Beau de Rochars said: "We need to keep talking, keep moving, keep walking together."